Bacid Probiotic Caplets 100 Caplets (Pack of 4) by Bacid at Maximum Wellness. Hurry! Limited time offer. Offer valid only while supplies last. Bacid probiotic dietary supplement caplets A dietary supplement that helps maintain a healthy balance of friendly bacteria in your digestive tract. 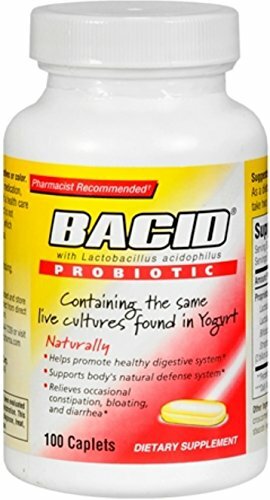 Bacid probiotic dietary supplement caplets A dietary supplement that helps maintain a healthy balance of friendly bacteria in your digestive tract. Promotes digestive function and health. The ingredients in BACID help you maintain a normal level of flora in the intestines. The unique BACID production process adds a protective protein matrix coating to the tablets to protect the bacteria from destructive acids in the stomach, ensuring that the bacteria arrive intact in the intestine. Each BACID caplet contains 2. 5 billion good bacteria at the time of manufacture but no additives which many people find hard to digest no preservatives, artificial colors, salt, wheat, soy, yeast or milk derivatives. If you have any questions about this product by Bacid, contact us by completing and submitting the form below. If you are looking for a specif part number, please include it with your message.